(Nanowerk News) Using a technique known as "nucleic acid origami," chemical engineers have built tiny particles made out of DNA and RNA that can deliver snippets of RNA directly to tumors, turning off genes expressed in cancer cells. Anderson is senior author of a paper on the particles appearing in the June 3 issue of Nature Nanotechnology ("Gene delivery: Designer DNA give RNAi more spine"). Lead author of the paper is former MIT postdoc Hyukjin Lee, now an assistant professor at Ewha Womans University in Seoul, South Korea. RNA interference (RNAi), a natural phenomenon that cells use to control their gene expression, has intrigued researchers since its discovery in 1998. Genetic information is normally carried from DNA in the nucleus to ribosomes, cellular structures where proteins are made. Short interfering RNA (siRNA) disrupts this process by binding to the messenger RNA molecules that carry DNA's instructions, destroying them before they reach the ribosome. siRNA-delivering nanoparticles made of lipids, which Anderson's lab and Alnylam are also developing, have shown some success in turning off cancer genes in animal studies, and clinical trials are now underway in patients with liver cancer. Nanoparticles tend to accumulate in the liver, spleen and lungs, so liver cancer is a natural target — but it has been difficult to target such particles to tumors in other organs. "When you think of metastatic cancer, you don't want to just stop in the liver," Anderson says. "You also want to get to more diverse sites." 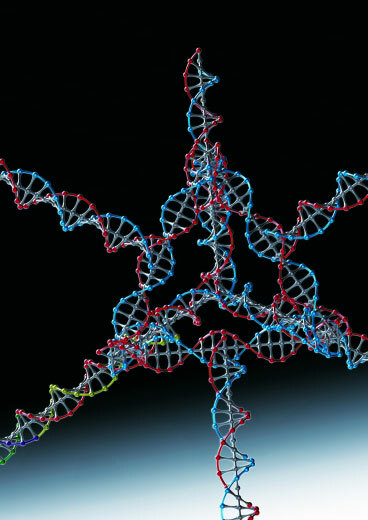 "What's particularly exciting about nucleic acid origami is the fact that you can make molecularly identical particles and define the location of every single atom," Anderson says. Using nucleic acid origami, the researchers have much more control over the composition of the particles, making it easier to create identical particles that all seek the right target. This is not usually the case with lipid nanoparticles, says Vinod Labhasetwar, a professor of biomedical engineering at the Lerner Research Institute at the Cleveland Clinic. "With lipid particles, you're not sure what fraction of the particles are really getting to the target tissue," says Labhasetwar, who was not involved in this study. "If you take a short interfering RNA and inject it into the bloodstream, it is typically gone in six minutes. If you make a bigger nanoparticle using origami methods, it increases its ability to avoid excretion through the kidneys, thereby increasing its time circulating in the blood" he says.